President Barack Obama assured the scientific community that he has erected a wall of separation between Church and science. “It is about ensuring . 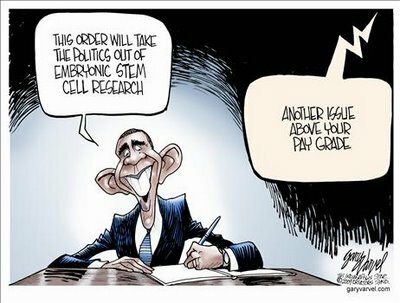 . . we make scientific decisions based on facts, not ideology,” President Obama lectured in 2009 as he signed his executive order lifting the ban on federal funding for embryonic stem cell research. He can’t have scientists constrained or manipulated by Christian ideologues. Society, according to Obama, should be listening to scientists not limiting them. Funding embryonic stem cell research, said our president, will restore “scientific integrity to government decision-making to ensure that in this new administration, we base our public policies on the soundest science….” But, are we basing our scientific discoveries on the soundest policy? Is it wise policy to allow scientists to make ethical decisions without a robust moral debate? As a person of faith, Obama insisted “we are called to care for each other and work to ease human suffering.” I suppose in his Orwellian double-speak, Obama is trying to pacify those who have moral qualms about scientific experiments unfettered by moral restraints. But, what exactly is this faith he believes? Easing human suffering sounds like a Christian tenet. In fact, Jesus said if you feed the hungry, clothe the naked or visit the sick it’s as if you are doing those things for him. But, would Jesus have advocated starving your children to feed the hungry, or stripping your neighbor to clothe to the naked, or killing human embryos to research a cure for paralysis? His example was about sacrificing himself for an unfit world, not about sacrificing some for the benefit of others. Secular humanism, on the other hand, does promote such a self-serving approach. Secular Humanism is the doctrine emphasizing a person’s capacity for self-realization through reason without regard to religion or the supernatural. This ethical theory and practice embraces scientific inquiry and human fulfillment in the natural world and repudiates the importance of a belief in God. There are no rewards or punishments in a “next life.” In other words, what we do in life will not echo in eternity. This humanist “truth” does not provide an internal moral restraint. Humanism, however, borrows some Christian moral values. Humanists see easing human suffering as a goal of its faith. This laudable humanitarianism (concern for human welfare) should not be confused with self-serving humanism. The trouble with humanistic humanitarianism is its utilitarian ethos– the ends justify the means. A person’s value, to a humanist, is wrapped up in his utility. A person who is aware of his own existence is more valuable than an infant or embryo. That paralyzed people will walk one day is an end that justifies the killing of embryonic humans today. Obama didn’t divorce ideology from the embryonic stem cell debate as he claims. He merely replaced the Bush administration’s Judeo-Christian ideology with a secular humanist one. In order for him to protect his policy choice from criticism, President Obama has erected this wall between Church and science. Using platitudes and the moral authority of a “consensus,” Obama has insisted science should be free from ideology. But what he means is science should be free from a Judeo-Christian ideology. He wants to use science in a utilitarian manner without the shackles of Christian conscience. Like bricklayers, humanist ideologues reinforce this wall. When liberals want to ramrod a morally repugnant policy while appearing to have weighed the moral consequences, they parade liberal theologians who parrot the liberal positions. Reverend Susan Brooks Thistlethwaite, a professor at Chicago Theological Seminary, said federal funding of embryonic stem cell research is “good policy for a religiously pluralistic society that cares about . . . the relief of human suffering.” A humanist utilitarian, not a Christian, can believe it to be good policy to relieve human suffering by making other less useful humans suffer. The late Francis Schaeffer, a Christian theologian, stated in A Christian Manifesto that liberal theology is nothing more than secular humanism in religious terms. Schaeffer affirmed that liberal theologians will invariably come down on the side of the secular humanist. 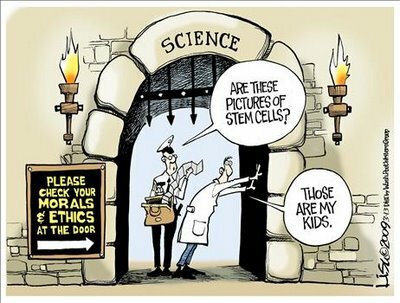 Liberal theologians have done so with abortion, social welfare, homosexual “marriage” and now, embryonic stem cell research. Taking the humanist philosophy logically further, what utility is there in handicapped people? Right now, humanists use the handicapped as a useful propaganda tool to further a liberal agenda. “Under President John F. Kennedy we were the first to walk on the moon. Under President Barack Obama the paralyzed will be the first to walk on earth.” Roman Reed, a paraplegic, pronounced that vision from his wheelchair while on hand to see President Obama reverse the Bush administration’s ban on federal stem cell funding. Now, despite that Mr. Reed misspoke, since Nixon was president when Neil Armstrong walked on the moon and Jesus has already made the lame to walk on earth, we can understand his expression of hope in the supposed miracles to be harnessed from embryonic stem cell research. The president, however, shamelessly uses the emotions that envelop this issue to make us believe his new stem cell policy will heal the sick. What happens when people like Roman Reed are no longer considered useful to humanist propagandists? History gives us examples of science under the influence of secular humanism. The early 20th century science of eugenics forcibly sterilized undesirables. The science of Social Darwinism’s euthanasia eliminated the handicapped in “mercy killings.” Margaret Sanger, who gave birth to Planned Parenthood, aimed the science of abortion and birth control at the unfit poor and racial minorities. Millions of people worldwide have been the victims of such “scientific integrity” for the benefit of humanity. Science without moral restraint is in reality the Frankenstein monster come to life. Obama hasn’t prevented science from being influenced by ideology. He just erected a wall of separation to protect it from certain ideologies. Obama’s wall of separation between Church and science leaves science vulnerable to the whims of the humanists who have no internal moral restraints. In the end, his wall of separation will harm those whom he claims it helps. This entry was posted in Church and Science, Scientism, Secular Humanism, Stem Cell Research, Utilitarianism and tagged church and science, culture war, scientism, secular humanism, stem cell research, utilitarianism on June 3, 2014 by DogTags.